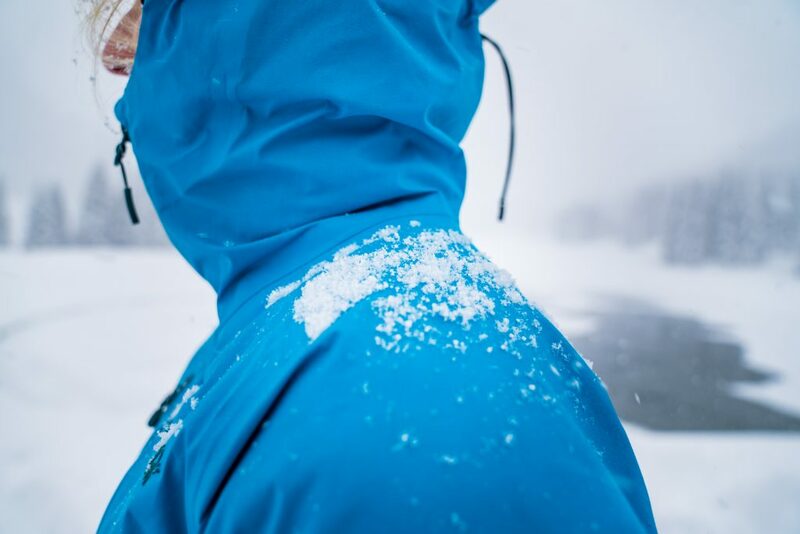 Over time, ski jackets can lose their water-repellency. Whether from rubbing against a dirty car while straining to reach the ski rack, or spilled apres-drinks, a dirty jacket will stop repelling water. Luckily, it’s easy to clean and re-waterproof your ski jacket so you can get back to schralping pow. The trick is to clean your jacket first. Most times, it’s dirt and crud that are covering the water-repellent coating, making your jacket soak up water. Place jacket(s) in washing machine. If you only have one jacket, maybe ask a friend if they want a clean jacket too. They can owe you. Add Nikwax Tech Wash. In a top-loading machine, add three full caps (150ml) for 1-3 garments or five full caps (250ml) for 4-6 garments. In a front loader, it’s best to add no more than two garments with two capfuls (100ml) of Tech Wash. Special note: If you live in an area with hard water, toss in an extra capful of Tech Wash. If you have an HE machine, use about half the recommended amount so you don’t suds up the place. Sit back with a good book and a glass of wine/beer/hot cocoa as the machine runs its course. More often than not, this single cycle will be enough to have revitalized your jacket. But my ski jacket still isn’t waterproof! That’s ok. Don’t panic. Over time the water-repellent finish can wear off. When that happens, it’s time to add more waterproofing. If you have a top-loading machine, let the machine fill, then add a maximum of 3 garments and 300ml of TX.Direct Wash-In. Run a heavy/warm cycle. If you have a front-loading machine, add a maximum of 2 garments and 200ml of TX.Direct. Put your jacket on and admire your waterproofed duds in the mirror. Now you’re ready to hit the slopes again and laugh at the soggy fools clustered around the fire pit. Or, maybe you can tell them about taking care of their ski jackets and spread the dryness. So cool, I received samples from your company at the end of drenching, soaking wet bike ride in the Seattle area, called Chilly Hilly. So appropriate! My ‘weatherproof’ jacket was put to the test, and failed miserably after 3 hours of constant rain. I am anxious to use your products, the Tech Wash and TX Direct, but there are no instructions! I wish your website had a link to all the instructions for each of your products. That would be very helpful. Meanwhile, could some one send me instructions? I’d love to put some new life back into my favorite ‘weatherproof’ cycling gear! It was great seeing all you hardy riders yesterday. It was Nikwax weather for sure! Happy to help with the instructions. The instructions are on those little bottles- but a bit hidden as the labels are peel and read. If you look on the back you should see a double thick part of the label. Peel that up! (It may require a fingernail.) The instructions are also on our product pages on the website. Look for the lines that reads: “Use Tech Wash (or TX.Direct) in a washing machine…” and click on them to get the instructions. Stay Dry and Ride On! Do I use any detergent at all? Or do I just use the Nik wax tech wash? Also what’s the difference between the nikwax texh wash and the TX direct wash in? Hi Tiffany! No detergent is needed. Detergents leave behind residue that attracts water to your jacket. 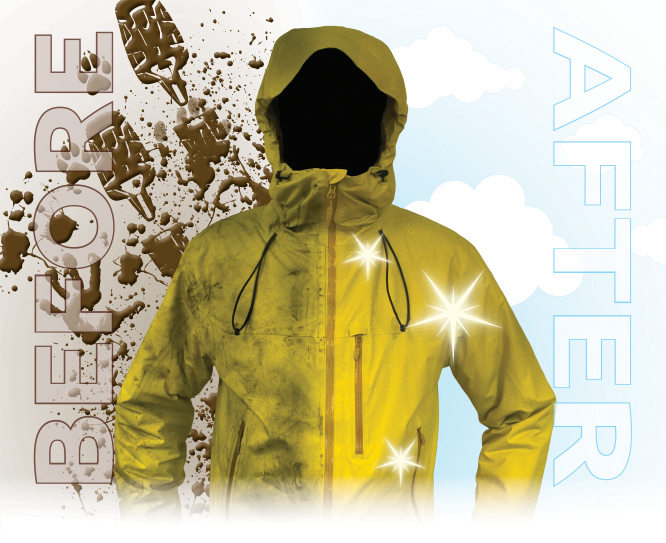 Tech Wash is a safe and effective way to clean your ski jacket without leaving any residue. The difference between Tech Wash and TX.Direct is that Tech Wash is a cleaner, and TX.Direct is a waterproofer. If you look at our caps you’ll see Tech Wash is Green and TX.Direct is Purple. An easy way to determine our products use is “Green for Clean, Purple for Proof”! Great tips! 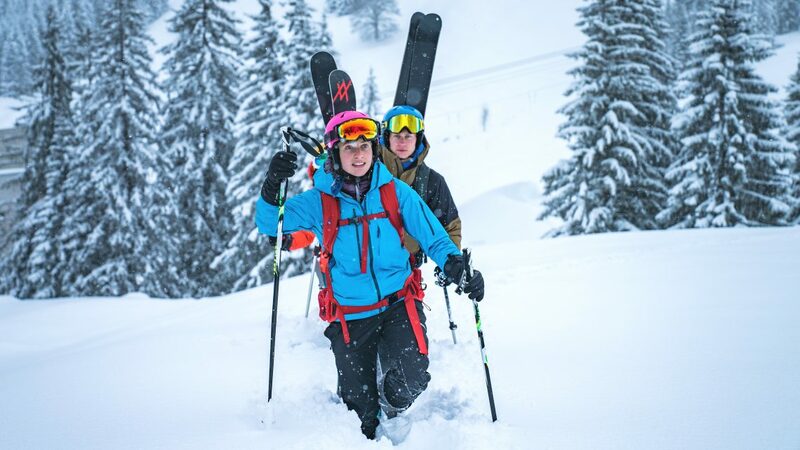 It become easy to re-waterproof your ski jacket by following your steps. Thanks for sharing. Hey Amanda! Glad we could be helpful! We hope you have a safe, dry winter! I have w cotton lining in my ski jacket. Will this affect the wash / will the cotton lining also get covered in the Nik Wax? 1) You can remove the lining, if that’s possible (zip away, velcro, etc.) and use the wash-in products like usual, following the care instructions on your garment. 2) If you can’t remove the lining, you can opt for hand washing the shell of the jacket (Tech Wash), being careful to avoid the lining. 3) You can also opt for the spray-on versions of some of our products (TX. Direct), in order to have control over what areas of the fabric are covered and what areas should not be. I assume “w cotton” means wax cotton, so that product would help you, in waterproofing your wax cotton lining. This sounds like a great product. I’d love to try it out but I’m a bit wary as my winter jacket has faux fur lining the hood – Do you think TX Direct would be safe to use on this particular type of jacket? 1) You can remove the lining or hood, if that’s possible (zip away, velcro, etc.) and use the wash-in products like usual, following the care instructions on your garment. 2) If you can’t remove the lining or hood, you can opt for waterproofing the shell of the jacket by hand, being careful to avoid the lining. A sponge or hand towel work well for this. Does your product leave a film on the washing machine bucket? Our products do not leave a film on the washing machine. If the garment manufacturer’s care instructions are followed and the instructions on the Nikwax bottle are followed, no film should be left. Do I put the liquid into the drum of the washing machine or in the draw where I put my normal washing powder? Hey Claire! For all Nikwax Wash-In products, you pour the product in the detergent drawer, but make sure you remove the drawer from the machine (should pop/slide right out) and rinse it off thoroughly under a faucet, to remove all the coagulated detergent that’s accrued over time or been left behind from previous washes. Since conventional detergent actually leaves behind a water-attracting film on most clothes, you want to make sure no conventional detergent finds its way into the washing cycle with Tech Wash.
Hello, I have a spyder Dare ski pants and is not water-proofed well as I baught it. I used Tech wash and Tech Spray last week followed your instruction. However my pants still have zero water repel. I wonder is your product desiged for Spyder jacket? Their website reccomended Nikeax, but they are not Gore-tex and seems doesn’t work at all? I just double-checked the Spyder website and it says that the Dare ski pants are indeed supposed to have a DWR coating from the factory. DWR stands for “Durable Water Repellent” and is a water-resistant layer that sits on top of nearly all ski and outdoor technical apparel. Typically a DWR will be rendered useless is the material is extremely dirty or extremely old. Your Spyder pants should have repellency built into them, or at least be repelling water after aNikwax treatment, so maybe it’s possible that your pants had some dirt and residue really embedded into the fabric and might require a bit more Tech Wash per wash than the standard garment. Also, have you ever washed the pants in standard detergent previously? That could be the reason. Or did you hang your pants up vertically when you sprayed them with TX Direct? That could be the reason. When using spray you want to lay your pants down on a table/horizontally and spray them. Sometimes, spraying on a vertically-hung garment allows for streaking, as the solution drips and runs down toward the ground, leaving behind thinly-applied areas or missed areas. Wash-In TX Direct is a more certain way of evenly covering an entire garment. Hi, do the Nikwax products contain silicone? My schoeller ski pants say to use none silicone based products. Do any Nikwax products contain silicon? Hey Andrew! All our products are silicone-free, PFC-free, biodegradable, non-persistent, non-flammable, aerosol-free, and safe for the home and the washing machine. Hope that helps! I have an Eider ski jacket that uses their defender fabric. Are both the Nikwax products suitable to use on this jacket? It took a lot of water over the last week of skiing no I’d rather not buy a new one. I have a cold weather Burton ski jacket with an insulated, non-removable liner. The jacket is older and has lost it’s waterproofing. Is it ok to use tx.direct wash-in, or will that negatively impact the wicking performance of the liner? I’m planning to use the tx wash-in and then apply the tx spray on for added protection. Will this work? Here’s my recommendation: wash the jacket (according to the jacket’s garment care label) in your washer, using Tech Wash in place of detergent. It will maintain breathability, clean your jacket, and maintain any waterproofing functionality that is still on the jacket. When the wash cycle ends, and the jacket is sitting damp in the bottom of the washer drum, run another wash cycle (according to the jacket’s garment care label) but this 2nd time, use TX.Direct in the detergent tray. I have a Napapijri skidoo jacket which is primarily made of polyamide and polyester. I’m looking to improve the overall waterproofing of the jacket, will the tech wash/tx. direct process work for this particular jacket? I appreciate your responses to these remarks. I have a similar question to one above that didn’t quite get answered. Are their benefits to multiple treatments (in a row without use) of the TX Direct wash in version? Or benefits to doubling up the use of the TX direct washin with a coat of spray on afterwards? Trying to save a toddler winter outfit for another season. Thanks! Is it safe to use Nikwax TX.Direct Wash-In on a cold weather gore-tex ski jacket which has Thinsulate liner to restore jackets waterproofing? Some say that it’s not recommended and TX.Direct is safe to use only with wet weather clothing without wicking liners. Hey Martin! Luckily, Nikwax makes Spray-On versions of TX Direct and SoftShell Proof, depending on your needs. This allows you to still prepare the garment like normal (washing in Tech Wash) and then have control over where the waterproofing is applied. For best practices and great tips on this, give our Customer Service team a quick call: 206-633-0063.